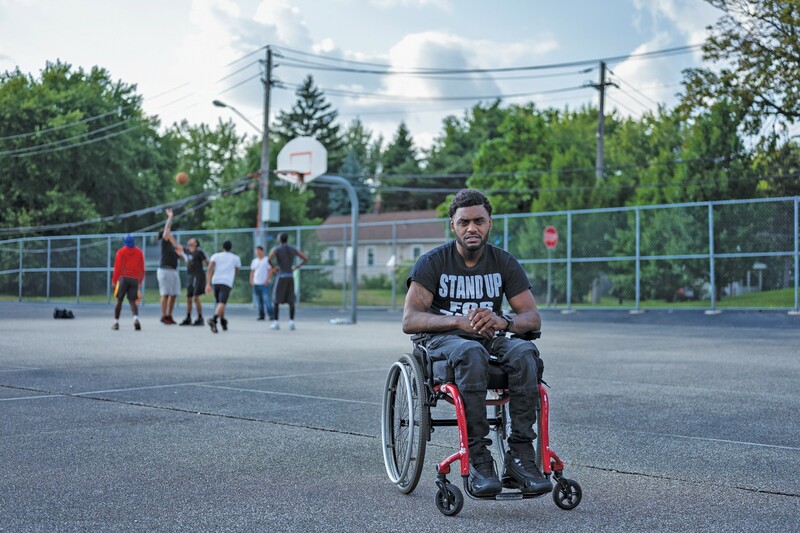 Antonio Mason was a student and basketball player at Cuyahoga Community College when he was paralyzed from the chest down by a drunk driver. He was denied compensation because, when he was 16, he was convicted in juvenile court of drug trafficking. After his father was murdered in Sarasota, Florida, in 2015, Anthony “Amp” Campbell was in shock. Not only had he lost his role model and supporter, he also worried about coming up with $10,000 to pay for the funeral and burial. The answer was no. His father, Johnnie Campbell, had been convicted of burglary in 1983 after a late-night break-in attempt at a local business, and Florida law is clear: People with certain types of felonies in their past cannot receive victim’s aid. It did not matter that the elder Campbell had changed in 30 years — the Sarasota City Commission called him a “prominent citizen” a month after his death — or that his son had never committed a crime. Florida is one of seven states that bar people with a criminal record from receiving victim compensation. The laws are meant to keep limited funds from going to people who are deemed undeserving. But the rules have had a broader effect: An analysis of records in two of those states — Florida and Ohio — shows that the bans fall hardest on black victims and their families, like the Campbells. States set their own eligibility rules. Most deny reimbursement to victims who refuse to cooperate with law enforcement or who were committing a crime that contributed to their injury or death. States with bans — which also include Arkansas, Louisiana, Mississippi, Rhode Island and North Carolina — go one step further, scouring the victim’s past. John Nardi, an alleged associate of the Cleveland crime family, was killed by a car bomb in 1977, and his widow collected $50,000 in victim compensation. The backlash was fierce. Lawmakers unsuccessfully sued the attorney general to block the payment, and by 1982, the first version of Ohio’s felony restriction law sailed through the legislature. “They always say that your juvenile record is sealed, they can’t use it against you as an adult. And yet they still found a way,” Mason said. The question of which crime victims deserve financial help has been raised since states first started setting up compensation programs in the 1960s and ’70s. Louisiana’s ban used to apply to anyone who had been convicted of a felony or was under correctional supervision — including probation or parole — in the five years before becoming a victim. But last month, at the request of the board, that period was reduced to three years. The ban does not apply to claims from sexual assault victims. For years, Johnnie Campbell lay in an unmarked grave because his son could still not afford the $4,000 headstone. A small flag was staked there in the interim, and several times it was swept away in bad weather. This story was produced by Reveal from the Center for Investigative Reporting, a nonprofit news organization, in collaboration with the Marshall Project and USA Today Network. Get Reveal’s investigations emailed to you by signing up at revealnews.org/newsletter.